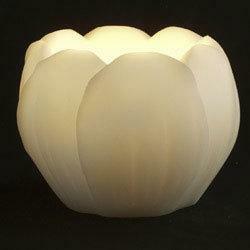 Armadilla Wax Lotus Flower Shaped Floating Pool Luminary is approximately 5" diameter x 5" in height. Crafted in bone white colored wax the "Lotus" luminary pool lantern candles are designed to be used as table top centerpeice candles and as luminary floating candles in pools, ponds & water vessels. Best of all, they're easy to use (and re-use) Each Lotus Flower Luminary includes a votive glass and two 12 hour votive candles. Designed and crafted by the Armadilla Wax Works. This beautifully crafted candle shell will bring you the unmatchable glow of real wax in a reusable form.